“It’s easy to ignore a problem if you don’t know it exists,” says IIHR and Iowa Flood Center Engineer Dan Ceynar. Ceynar knows what’s hiding under the surface of Iowa’s rivers, and a lot of it isn’t pretty: tires, water heaters, stoves, snowmobiles, refrigerators, bicycles, bed frames, and more. “You name it, it’s been pulled out,” Ceynar says. Ceynar has firsthand knowledge about pulling trash out of rivers. He’s been involved with the Iowa Department of Natural Resources’ Project AWARE (A Watershed Awareness River Expedition) since 2006, when it came to the Iowa River near Iowa City. He’s now a river clean-up veteran who brings shovels and other tools to excavate the big stuff out of the mud – such as sections of cars, or, in several instances, boats – including a 17-foot fiberglass ski boat. This year, 388 participants ranging in age from 2 to 80 cleaned up 91 miles of the Big Sioux River, which forms the border between Iowa and South Dakota in northwest Iowa. They removed 28.8 tons of trash (that’s 57,523 pounds!) 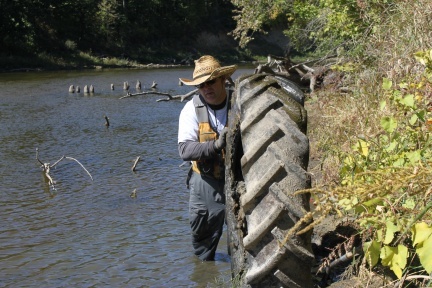 from the river, including 549 tires. The six-day project moves to a different Iowa watershed for one week each July, bringing hundreds of canoe-based volunteers to clean up the stuff that shouldn’t be there. The effort is sponsored by the Iowa Department of Natural Resources (this year with support from South Dakota Game, Fish, and Parks), with help from other sponsors such as IIHR—Hydroscience & Engineering and the Iowa Flood Center. Most participants camp in tents and share evening campfires along the river after a catered meal and educational programs. There’s often music, and lots of low-key socializing. One of the best things about Project AWARE is its power to change hearts and minds, Ceynar says – especially for kids. He hopes that seeing the vast amounts of trash the clean-up pulls from the river can help bring about a change of attitude in kids and adults alike. The Iowa State Chapter of the Association of State Floodplain Managers (ASFPM) was the recipient of the ASFPM National 2014 Tom Lee State Award for Excellence in Floodplain Management. The award was made during the 2014 annual conference in June, based on two of four training modules the Iowa Floodplain & Stormwater Management Association (IFSMA) developed under contract with the Iowa Department of Natural Resources (IDNR): the CRS Toolkit for Iowa Communities and an Iowa Flood Response Toolkit. Since the award and annual conference, IFSMA has completed two additional training modules – one is to assist Delegated Communities in fulfilling their responsibilities in administering their communities’ floodplain ordinances and the other is an updated Desk Reference Manual. All four training modules are available on the IFSMA website: www.Iowafloods.org. The Iowa Floodplain Mapping team. Accurate scientific information will be one of Iowa’s best defenses against future floods, says Iowa Flood Center Associate Director Nathan Young. He is leading an effort to update floodplain maps for 85 of Iowa’s 99 counties. Young, who is also an IIHR research engineer, says that the new floodplain maps provide a direct and easy-to-understand way to communicate flood risk to Iowans. The IFC, located at the University of Iowa’s IIHR—Hydroscience & Engineering, is about one year into the four-year Iowa Floodplain Mapping Project, funded with $10 million from the U.S. Department of Housing and Urban Development. Working closely with the Iowa Department of Natural Resources (DNR), the IFC will develop floodplain maps for the Iowa counties that were declared federal disaster areas after the 2008 floods. Some or all of the maps will eventually be adopted by the Federal Emergency Management Agency (FEMA) as regulatory maps. The scope of the project is huge. IFC researchers are mapping all streams draining one square mile or more. To accomplish this, they rely heavily on statewide LiDAR (laser radar) data recently collected by the DNR. LiDAR is a remote-sensing technology that researchers use to develop digital elevation models of the land surface. The availability of LiDAR was a major reason mapping funds were allocated to the state, Young says. “LiDAR data allow for more precise delineation of floodplain boundaries.” With these data, the team will be able to describe Iowa’s river and stream networks, develop computer-based flood simulations, and delineate floodplains with reasonable accuracy. The project involves digitizing the state’s stream network, performing hydraulic and hydrologic analyses, and using the results to create maps. After a successful pilot project in Poweshiek County, the team turned to the statewide effort. The extent of the project requires the development of innovative, efficient new floodplain mapping tools, and the new data products will offer value beyond the mapping projects. University of Iowa students, too, will benefit. Their work is essential to the project, and they will take away tremendous practical applied engineering experience. Graduate student Nick Thomas came to Iowa with an undergraduate engineering degree from the University of Minnesota in the fall of 2010, just in time to get in on the start of the floodplain mapping project. When the maps are complete, Young says, they will guide floodplain regulation and management. Iowans will be able to access them on the Internet to better understand and identify their flood risks. Read more about the statewide floodplain mapping project. Floods can strike with surprising speed, and they often occur in unexpected places. That’s why — even in December — the Iowa Flood Center (IFC) at the University of Iowa continues to expand a network of affordable stream sensors. Attached to the downstream side of bridges, the sensors provide Iowans with an up-to-the-minute report on water levels in Iowa’s rivers and streams.